Choose any of our wonderful Kauai vacation condos and we are sure you will never want to return home! All of our condo homes have a view of the sparkling, blue Pacific Ocean. We are crazy about cleanliness and it shows. All of our condo homes are spotlessly clean. 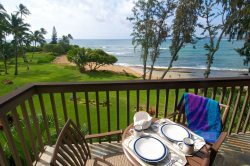 Steps from the warm sand and cool water, spend lazy days and quiet nights in a Lae Nani, The Jewel of The Coconut Coast Kauai Kailani or Kauai Beach Villas Resort. Lae Nani is a pure reflection of Kauais tropical paradise, with a lush and well-tended landscape, beautifully manicured lawns and tall coconut palms that combine for a wonderful Hawaii vacation experience. Lae Nani has quick access to the sandy beach and a protected ocean pool along beautiful Papaloa Bay. Wake up with a morning dip in the refreshing swimming pool before you head out to explore Kauai. Other amenities include tennis, free parking and poolside grills. Great views from our 3rd floor condos. Newly updated one bedroom condo with great view. Ground floor convenience. Our largest condos. Three bedroom units.